SUMMARY. Aim. A wide range of clinical phenomena have been reported with dose reduction or drug discontinuation of Selective Serotonin Reuptake Inhibitors (SSRIs) or Serotonin Norepinephrine Reuptake Inhibitors (SNRIs). In 2015, a new classification of SSRIs/SNRIs withdrawal (i.e., new withdrawal symptoms, rebound symptoms withdrawal, persistent post-withdrawal disorders) was outlined on the basis of the literature and clinical observations. A semistructured clinical interview, the Diagnostic clinical Interview for Drug Withdrawal 1 - New Symptoms of SSRI and SNRI (DID-W1), was developed for identifying and differentiating such syndromes. Its inter-rater reliability has been tested. Methods. Seventeen consecutive outpatients with a history of SSRI or SNRI dose reduction or discontinuation were assessed independently by 2 clinicians at different times during the same day. Percent agreement, Cohen’s kappa, and the squared correlation coefficient were used to measure inter-rater reliability. Results. The percent agreement for the whole interview was 97.06%, the Cohen’s kappa 0.85 (95% CI of 0.61-1.08), the squared correlation coefficient 0.72. Discussion and conclusions. The kappa values indicated excellent inter-rater agreement. Validity evaluation and comparison with other instruments need to be performed. The DID-W1 may help diagnosing the clinical phenomena related to SSRI and SNRI discontinuation, their differentiation from relapse, and the potential iatrogenic origin of psychiatric symptoms in clinical practice. KEY WORDS: withdrawal, selective serotonin reuptake inhibitor, serotonin norepinephrine reuptake inhibitor, interview, reliability, iatrogenic comorbidity. RIASSUNTO. Scopo. Dopo la riduzione della dose o la sospensione di Selective Serotonin Reuptake Inhibitors (SSRI) o di Serotonin Norepinephrine Reuptake Inhibitors (SNRI) si possono verificare molti fenomeni clinici. Nel 2015, è stata delineata una nuova classificazione delle sindromi d’astinenza da SSRI/SNRI (cioè, nuovi sintomi, rimbalzo, disturbi persistenti post-astinenza) sulla base della letteratura e delle osservazioni cliniche. Un’intervista clinica semistrutturata, la Diagnostic clinical Interview for Drug Withdrawal 1 - New Symptoms of SSRI and SNRI (DID-W1), è stata sviluppata allo scopo di identificare e differenziare queste sindromi. La sua affidabilità fra valutatori è stata testata. Metodi. Diciassette pazienti ambulatoriali consecutivi con una storia di riduzione o sospensione di SSRI o SNRI sono stati valutati indipendentemente da 2 clinici in tempi diversi dello stesso giorno. La percentuale di accordo, il kappa di Cohen e il quadrato del coefficiente di correlazione sono stati utilizzati per misurare l’affidabilità fra i valutatori. Risultati. La percentuale di accordo fra i valutatori relativamente all’intera intervista è risultata pari al 97,06%, il kappa di Cohen è risultato pari allo 0,85 (IC95% di 0,61-1,08), il quadrato del coefficiente di correlazione è risultato pari allo 0,72. Discussione e conclusioni. I valori di kappa indicano un eccellente accordo fra i valutatori. Sono opportune ulteriori indagini sulla validità e confronti con altri strumenti. La DID-W1 può aiutare a diagnosticare i fenomeni clinici collegati alla sospensione di SSRI e SNRI, a differenziarli dalla ricaduta e a identificare l’origine potenzialmente iatrogena dei sintomi psichiatrici nella pratica clinica. PAROLE CHIAVE: astinenza, inibitori selettivi della ricaptazione della serotonina, inibitori della ricaptazione di serotonina e noradrenalina, intervista, affidabilità, comorbilità iatrogena. In 1968, Di Mascio and Shader introduced the concept of behavioral toxicity of psychotropic medications which referred to the pharmacologic actions of a drug that, within the range in which it has been found to possess clinical utility, may produce alterations in mood, perceptual, cognitive, and psychomotor functions that limit the capacity of the individual or constitute a hazard to well-being1-3. In 1980, Perl and co-authors reviewed this concept discussing the mechanisms by which psychotropic drugs can cause adverse reactions, that is through the extension of their primary therapeutic action and/or the onset of secondary actions as well as withdrawal, dependence, and tolerance symptoms4. The concept of drug-induced illness was reported by Chouinard et al.5,6 during antipsychotic withdrawal or switch, using the model of neuroleptic-induced tardive dyskinesia with the sub-types of withdrawal, overt, masked, and persistent7. The same concepts were applied to antidepressant withdrawal8,9 and Fava et al.10 defined a form of behavioral toxicity as iatrogenic comorbidity providing differentiation between adverse or emergent events that are limited to the period of psychotropic drug administration and effects that may persist long after drug discontinuation10. They suggested that psychotropic drug treatment, particularly after long-term use, may increase the risk of experiencing additional psychological problems or of modifying responsiveness to subsequent treatments11. There is a consistent body of knowledge that indicates that dose reduction or discontinuation of Selective Serotonin Reuptake Inhibitors (SSRI) or Serotonin Norepinephrine Reuptake Inhibitors (SNRI) induces a number of clinical phenomena (i.e., withdrawal or discontinuation syndromes, rebound symptoms, persistent post-withdrawal disorders) both in adults and in children12-20. There have been various definitions17,21,22 as well as diagnostic criteria23,24 of these clinical phenomena. In 2015, a comprehensive and new classification of SSRIs/SNRIs withdrawal phenomena was outlined and specific diagnostic criteria were proposed9, they allow to formulate the diagnosis of three different syndromes: new symptoms, rebound, persistent post-withdrawal disorders9 (Table 1). The prevalence of these syndromes is not known at the moment, due to their very recent definition and a lack of diagnostic tools. • the fifth module (named DID-W1-WS3) allows to formulate the diagnosis of current as well as lifetime persistent post-withdrawal disorders (12 questions in section a, 13 questions in section b). Modules DID-W1-WS1, DID-W1-WS2, DID-W1-WS3 include two sections each (section a, section b) which allow to formulate the current (section a) and the lifetime (section b) diagnosis of each disorder. Table 2 reports the first question of module DID-W1-WS1 section as an example. • the fourth column (named “INSTRUCTION FOR THE INTERVIEWER”) describes the instruction which must be followed by the clinical interviewer to conduct the interview. The rater answers YES/NO. The diagnostic algorithm produces the final diagnoses. At the end of each section a and b, a diagnostic box is provided where the clinical interviewer ticks whether the diagnostic criteria were satisfied or not. The items of the DID-W1 were derived from well-known and validated diagnostic interviews and scales: the Structured Clinical Interview for DSM-5, Clinician Version, SCID-5 -CV26; the Mini International Neuropsychiatric Interview (MINI) 7.0.227; the Clinical Interview for Depression28; the Richmond Agitation-Sedation Scale29; the Beck Depression Inventory-II30,31; the Extrapyramidal Symptom Rating Scale31; the Positive and Negative Syndrome Scale32; the Somatic Symptom Scale-8 (SSS-8)33; the State Trait Anxiety Inventory – Form Y34; the Psychosocial Index35,36. Seventeen consecutive self-referred outpatients with a history of SSRI or SNRI reduction or discontinuation were assessed by 2 clinicians (1 psychiatrist, 1 clinical psychologist) independently at different times during the same day. This was an adequate sample size for the purpose of validating the interview37. All patients were studied at the Department of Health Sciences of the University of Florence. The mean age was 43.18 years (SD=11.21 years, range 26-63 years), they were 8 males and 9 females. The patients had received the antidepressants to treat (diagnoses formulated via the SCID-5 -CV)26: major depressive episode (n=5; 29.41%), major depressive disorder (n=3; 17.65%), panic disorder (n=3; 17.64%), panic disorder and agoraphobia (n=3; 17.64%), panic disorder and major depressive episode (n=1; 5.88%), obsessive-compulsive disorder (n=1; 5.88%), schizoaffective disorder (n=1; 5.88%). The patients had been treated with paroxetine (n=6; 35.29%), sertraline (n=5; 29.41%), citalopram (n=2; 11.76%), escitalopram (n=2; 11.76%), fluvoxamine (n=1; 5.89%), venlafaxine (n=1; 5.89%). The DID-W1 was tested as to the inter-rater agreement requirement. It was administered by 2 raters independently assessing the same patient in different times of the same day. This is the most customary way of assessing observer variability that may arise from differences in input, procedure, or users. Percent agreement and Cohen’s kappa were used to measure inter-rater reliability. Percent agreement is directly interpreted as the percent of data that are correct. Cohen’s kappa (κ), a robust statistic for inter-rater testing, is a form of correlation coefficient which cannot be directly interpreted, but a squared correlation coefficient, called the coefficient of determination is directly interpretable38. Similar to correlation coefficients, kappa can range from −1 to +1, where 0 represents the amount of agreement that can be expected from random chance, and 1 represents perfect agreement between the raters. Cohen suggested the kappa result be interpreted as follows: ≤0 no agreement; 0.01-0.20 none to slight; 0.21-0.40 fair; 0.41-0.60 moderate; 0.61-0.80 substantial; 0.81-1.00 almost perfect agreement39. We designed the DID-W1, the first diagnostic interview for identifying and differentiating drug withdrawal. It was based on the new diagnostic criteria proposed by Chouinard & Chouinard9 taking as model the withdrawal syndromes associated with all psychotropic drugs including narcotics, hypnotics, anxiolytics, and drugs given in medicine to treat for example high blood pressure25. This semi-structured clinical interview aims at formulating the diagnosis of new symptoms, rebound, and persistent postwithdrawal disorders according to the diagnostic criteria by Chouinard & Chouinard9. This is the first study testing the psychometric properties of the DID-W1, inter-rater reliability results are here presented. The percent agreement for the whole interview was 97.06%, the Cohen’s kappa was 0.85 (SE=0.083) with a 95% CI of 0.61-1.08, the squared correlation coefficient was 0.72. Inter-rater concordance was excellent. Table 3 reports the percent agreement, the Cohen’s kappa with 95% CI, and the squared correlation coefficient for each diagnosis. 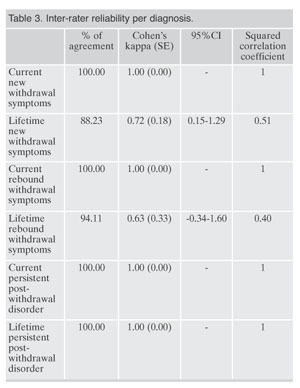 A kappa value above 0.80 indicates excellent inter-rater agreement and suggests that the DID-W1 is a reliable method for diagnostic evaluation in SSRI/SNRI withdrawal syndromes. This is the first tool designed to identify and classify the various clinical manifestations that are associated with SSRI and SNRI discontinuation, according to Chouinard & Chouinard’s9 diagnostic criteria. 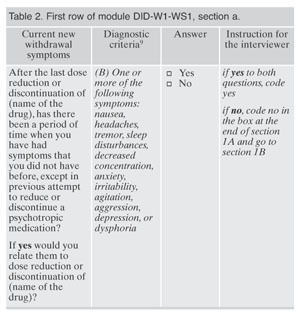 The most widely used method for assessing such phenomena has been for a long time the Discontinuation Emergence Signs and Symptoms (DESS)40, a checklist of signs and symptoms of withdrawal with no diagnostic purposes, even though the patients may be classified as experiencing a withdrawal syndrome if the number of DESS checklist events increased by four or more during the discontinuation period. The DID-W1 is an interview which may have a number of important clinical and research implications. First, it is a tool for identifying and differentiating the clinical phenomena that may occur upon SSRI and SNRI discontinuation. Not surprisingly, there is a wide variation (between 14 and 78%) on the incidence of withdrawal symptoms after dose reduction, discontinuation, or switch of SSRIs or SNRI9,41. It may depend on drug differences and on the samples that are studied, but also on the lack of suitable diagnostic instruments. Second, it may help differentiating withdrawal phenomena from relapse9,42. In clinical practice, lack of appraisal of withdrawal phenomena may lead to inappropriate clinical decisions, such as unnecessary re-institution of drug treatment. In research, it may allow to differentiate between withdrawal phenomena and relapse after antidepressant discontinuation, which would otherwise be impossible to discern43; it may yield a full assessment of side effects of antidepressant drugs41; it may lead to a correct identification of distress and use of antidepressants in epidemiological studies44. Finally, psychiatric symptoms in clinical practice may also be a consequence of previous pharmacological treatments, the so called iatrogenic comorbidity, that would require removal of the drug but is more often interpreted as a justification for new treatment11. For instance, much of the refractoriness to treatment of anxious depression may be actually due to post-withdrawal disorders that are secondary to the use of antidepressant drugs in anxiety disorders45. Such research efforts pertain to the domains of clinical pharmacopsychology, an emerging area that is concerned with the subtle psychological modification induced by psychotropic and medical drugs, with particular reference to behavioral toxicity and iatrogenic comorbidity46,47. It is hoped that the DID-W1 will encourage studies on this topic and may lead to a refinement of patients’ assessment, as well as treatment, in clinical settings. There is however the need for other reliability studies on the DID-W1 such as comparisons with the DESS as well as construct validity studies. There is also need of similar semi-structured interviews to be produced for classifying withdrawal syndrome related to other drugs, such as antipsychotics25. Acknowledgment: the copyright of the DID-W1 The Diagnostic clinical Interview for Drug Withdrawal 1 - New Symptoms of SSRI and SNRI was deposited by the University of Florence (Italy), at the request of Fiammetta Cosci and on the basis of a copyright management agreement with Guy Chouinard, Harvard Medical School (as what concerns Virginie-Anne Chouinard), and University of Bologna (as what concerns Giovanni Andrea Fava). Formatting of funding resources: this research did not receive any specific grant funding agencies in the public, commercial, or not-for-profit sectors. 1. Di Mascio A, Shader RI, Giller DR. Behavioral toxicity of psychotropic drugs: III. Effect on perceptual functions. IV. Effect on emotional (mood) states. Conn Med 1968; 32: 771-5. 2. Di Mascio A, Shader RI, Harmatz GS. Behavioral toxicity of psychotropic drugs: V. Effects on gross behavioral patterns. Connect Med 1969; 33: 279-81. 3. Di Mascio A, Shader RI. Behavioral toxicity of psychotropic drugs. I. Definition. II. Toxic effects on psychomotor functions. Connect Med 1968; 32: 617-20. 4. Perl M, Hall RCW, Gardner ER. Behavioral toxicity of psychiatric drugs. In: Hall RCW (ed). Psychiatric presentations of medical illness. New York: Spectrum Publications, 1980. 5. Chouinard G, Young SN, Annable L, Sourkes TL. Tryptophan dosage critical for its antidepressant effect. Br Med J 1978; 1: 1422. 6. Chouinard G, Jones BD. Neuroleptic-induced supersensitivity psychosis: clinical and pharmacologic characteristics. Am J Psychiatry 1980; 137: 16-21. 7. Chouinard G, Chouinard VA. Atypical antipsychotics: CATIE study, drug-induced movement disorder and resulting iatrogenic psychiatric-like symptoms, supersensitivity rebound psychosis and withdrawal discontinuation syndromes. Psychother Psychosom 2008; 77: 69-77. 8. Bhanji NH, Chouinard G, Kolivakis T, Margolese HC. Persistent tardive rebound panic disorder, rebound anxiety and insomnia following paroxetine withdrawal: a review of rebound-withdrawal phenomena. Can J Clin Pharmacol 2006; 13: e69-74. 9. Chouinard G, Chouinard VA. New classification of selective serotonin reuptake inhibitor withdrawal. Psychother Psychosom 2015; 84: 63-71. 10. Fava GA, Tomba E, Tossani E. Innovative trends in the design of therapeutic trials in psychopharmacology and psychotherapy. Prog Neuropsychopharmacol Biol Psychiatry 2013; 40: 306-11. 11. Fava GA, Cosci F, Offidani E, Guidi J. Behavioral toxicity revisited: iatrogenic comorbidity in psychiatric evaluation and treatment. J Clin Psychopharmacol 2016; 36: 550-3. 12. Oehrberg S, Christiansen PE, Behnke K, et al. Paroxetine in the treatment of panic disorder. A randomised, double-blind, placebo-controlled study. Br J Psychiatry 1995; 167: 374-9. 13. Price JS, Waller PC, Wood SM, MacKay AV. A comparison of the post-marketing safety of four selective serotonin re-uptake inhibitors including the investigation of symptoms occurring on withdrawal. Br J Clin Pharmacol 1996; 42: 757-63. 14. Fava M, Mulroy R, Alpert J, Nierenberg AA, Rosenbaum JF. Emergence of adverse events following discontinuation of treatment with extended-release venlafaxine. Am J Psychiatry 1997; 154: 1760-2. 15. Stahl MM, Lindquist M, Pettersson M, et al. Withdrawal reactions with selective serotonin re-uptake inhibitors as reported to the WHO system. Eur J Clin Pharmacol 1997; 53: 163-9. 16. Lejoyeux M, Ades J. Antidepressant discontinuation: a review of the literature. J Clin Psychiatry 1997; 58 Suppl 7: 11-5; discussion 6. 17. Zajecka J, Tracy KA, Mitchell S. Discontinuation symptoms after treatment with serotonin reuptake inhibitors: a literature review. J Clin Psychiatry 1997; 58: 291-7. 18. Hosenbocus S, Chahal R. SSRIs and SNRIs: a review of the Discontinuation Syndrome in Children and Adolescents. J Can Acad Child Adolesc Psychiatry 2011; 20: 60-7. 19. Offidani E, Fava GA, Sonino N. Iatrogenic comorbidity in childhood and adolescence: new insights from the use of antidepressant drugs. CNS Drugs 2014; 28: 769-74. 20. Fava GA, Gatti A, Belaise C, Guidi J, Offidani E. Withdrawal symptoms after selective serotonin reuptake inhibitor discontinuation: a systematic review. Psychother Psychosom 2015; 84: 72-81. 21. Schatzberg AF, Haddad P, Kaplan EM, et al. Serotonin reuptake inhibitor discontinuation syndrome: a hypothetical definition. Discontinuation Consensus panel. J Clin Psychiatry 1997; 58 Suppl 7: 5-10. 22. Haddad PM, Devarajan S, Dursun SM. Antidepressant discontinuation (withdrawal) symptoms presenting as ‘stroke’. J Psychopharmacol 2001; 15: 139-41. 23. Black K, Shea C, Dursun S, Kutcher S. Selective serotonin reuptake inhibitor discontinuation syndrome: proposed diagnostic criteria. J Psychiatry Neurosci 2000; 25: 255-61. 24. Haddad P. The SSRI discontinuation syndrome. J Psychopharmacol 1998; 12: 305-13. 25. Chouinard G, Samaha AN, Chouinard VA, et al. Antipsychotic-induced dopamine supersensitivity psychosis: pharmacology, criteria, and therapy. Psychother Psychosom 2017; 86: 189-219. 26. First MB, Williams JBV, Smith Benjamin L, Spitzer RL. Structured Clinical Interview for DSM-5 Disorders, Clinician Version (SCID-5-CV). Arlington, VA: American Psychiatric Association, 2015. 27. Sheehan DV, Lecrubier Y, Sheehan KH, et al. The Mini-International Neuropsychiatric Interview (M.I.N.I. ): the development and validation of a structured diagnostic psychiatric interview for DSM-IV and ICD-10. J Clin Psychiatry 1998; 59 Suppl 20: 22-33; quiz 4-57. 28. Guidi J, Fava GA, Bech P, Paykel E. The Clinical Interview for Depression: a comprehensive review of studies and clinimetric properties. Psychother Psychosom 2011; 80: 10-27. 29. Sessler CN, Gosnell MS, Grap MJ, et al. The Richmond Agitation-Sedation Scale: validity and reliability in adult intensive care unit patients. Am J Respir Crit Care Med 2002; 166: 1338-44. 30. Beck AT, Steer RA, Ball R, Ranieri W. Comparison of Beck Depression Inventories -IA and -II in psychiatric outpatients. J Pers Assess 1996; 67: 588-97. 31. Chouinard G, Margolese HC. Manual for the Extrapyramidal Symptom Rating Scale (ESRS). Schizophr Res 2005; 76: 247-65. 32. Kay SR, Fiszbein A, Opler LA. The positive and negative syndrome scale (PANSS) for schizophrenia. Schizophr Bull 1987; 13: 261-76. 33. Gierk B, Kohlmann S, Kroenke K, et al. The somatic symptom scale-8 (SSS-8): a brief measure of somatic symptom burden. JAMA Intern Med 2014; 174: 399-407. 34. Spielberger CD, Gorsuch RL, Vagg PR, Jacobs GA. Manual for the State-Trait Anxiety Inventory. Palo Alto, CA: Consulting Psychologists Press, 1983. 35. Sonino N, Fava GA. A simple instrument for assessing stress in clinical practice. Postgrad Med J 1998; 74: 408-10. 36. Piolanti A, Offidani E, Guidi J, Gostoli S, Fava GA, Sonino N. Use of the Psychosocial Index: a sensitive tool in research and practice. Psychother Psychosom 2016; 85: 337-45. 37. Feinstein AR. Clinimetrics. New Haven: Yale University Press, 1987. 38. McHugh ML. Interrater reliability: the kappa statistic. Biochem Med 2012; 22: 276-82. 39. Cohen J. A coefficient of agreement for nominal scales. Educ Psychol Meas 1960; 20: 10. 40. Rosenbaum JF, Fava M, Hoog SL, Ascroft RC, Krebs WB. Selective serotonin reuptake inhibitor discontinuation syndrome: a randomized clinical trial. Biol Psychiatry 1998; 44: 77-87. 41. Carvalho AF, Sharma MS, Brunoni AR, Vieta E, Fava GA. The safety, tolerability and risks associated with the use of newer generation antidepressant drugs: a critical review of the literature. Psychother Psychosom 2016; 85: 270-88. 42. Fava GA. Rational use of antidepressant drugs. Psychother Psychosom 2014; 83: 197-204. 43. Batelaan NM, Bosman RC, Muntingh A, Scholten WD, Huijbregts KM, van Balkom A. Risk of relapse after antidepressant discontinuation in anxiety disorders, obsessive-compulsive disorder, and post-traumatic stress disorder: systematic review and meta-analysis of relapse prevention trials. BMJ 2017; 358: j3927. 44. Huijbregts KM, Hoogendoorn A, Slottje P, van Balkom A, Batelaan NM. Long-term and short-term antidepressant use in general practice: data from a large cohort in the Netherlands. Psychother Psychosom 2017; 86: 362-9. 45. Fava GA, Tomba E. Treatment of comorbid anxiety disorders and depression. In: Emmelkamp P, Ehring T (eds). The Wiley Handbook of Anxiety Disorders. Chichester, UK: John Wiley & Sons, 2014. 46. Fava GA, Tomba E, Bech P. Clinical pharmacopsychology: conceptual foundations and emerging tasks. Psychother Psychosom 2017; 86: 134-40. 47. Fava GA, Staccini L, Delle Chiaie R, Belaise C, Tomba E. [Clinical pharmacopsychology]. Riv Psichiatr 2014; 49: 251-4.